The Crosby At Rancho Santa Fe is a beautiful gated community of about 722 acres featuring 443 custom and semi-custom homes. This master-planned community is located 5 miles west of Interstate 15, and 5 miles east of Interstate 5.The luxurious community gets its name from Bing Crosby, the famous American singer and actor. The artistic and stunning architecture of Crosby blends remarkably well with the historic charm of Rancho Santa Fe. Members of the Crosby can enjoy an incredible array of facilities like the 18-hole golf course, well-maintained swimming pool, exquisite spa, sports center and restaurant. Email Info@talechia.com for membership details. Rancho Santa Fe is also an excellent place for families. There are excellent schools, parks and recreation facilities for children. The broad range of activities in Rancho Santa Fe include hiking, horseback riding, tennis, extensive private trail systems, organized sports leagues and of course, golfing. Recognizing both the need for and the lifelong benefits of an excellent education, residents of The Crosby are attracted by its location within the Solana Beach School District. 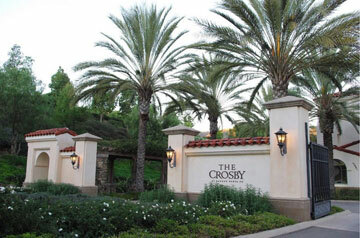 Private schools abound in San Diego Country, and some of the state’s finest are within close proximity to The Crosby. For further information regarding the schools associated with The Crosby, please contact the school’s office directly.